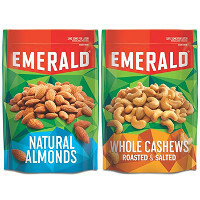 Emerald Natural Almonds - Unpretentious and unadorned. These almonds are so close to nature, you can almost sense the orchard breeze. Sometimes less is more. The Nutologists at Emerald are working tirelessly to bring you the tastiest breakthroughs in the realm of nut experience.